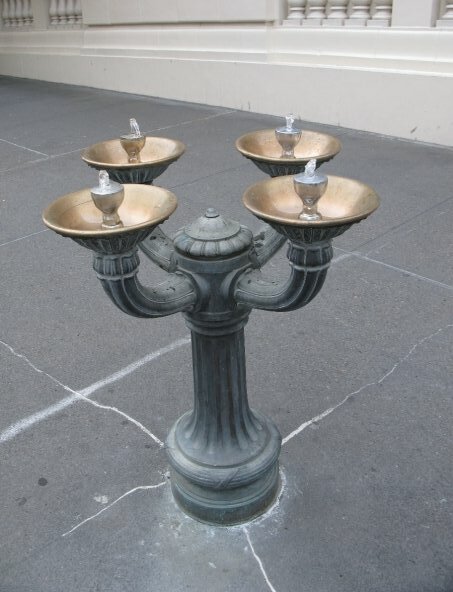 The famous Benson Bubbler, signature drinking fountain of Portland, runs continuously with fresh Oregon water. They were donated to the city by Simon Benson, who hoped to keep people out of bars and saloons. Four perfect bronze disks catch water that catches the wind. Perhaps it's the abundance of four ever-flowing jets that makes these so alluring. The perfect symmetry of the fountain, too, is something modern drinking fountains lack. The later addition of hygiene guards and the innovation of the arc of water create a definite directionality in all contemporary drinking fountains, whereas this one is purely upward and joyous to the sun. The thirsty wanderer can find refreshment all over the city: see the map of all the Benson Bubblers below. If all cities had extensive networks of beautiful drinking fountains, maybe the US wouldn't consume 1,500 disposable plastic water bottles per second.